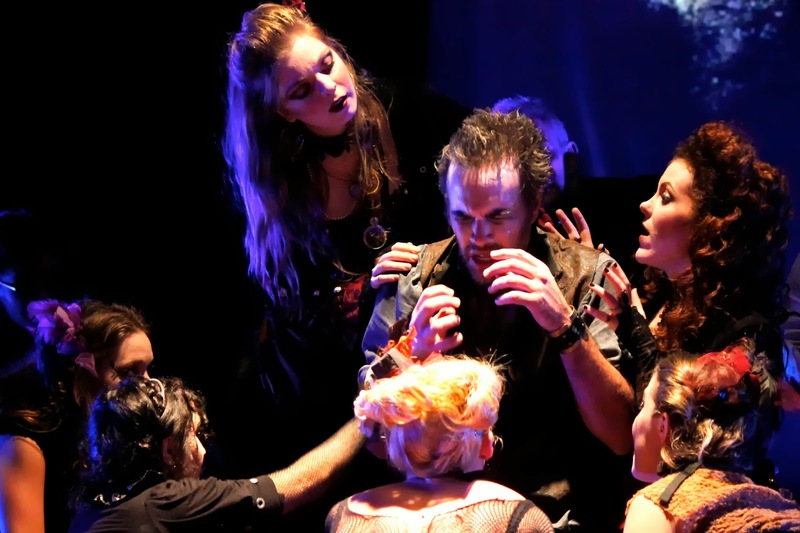 ORLANDO — “Phantasmagoria IV: Hell Hath Risen” is the fourth installment of an annual Halloween inspired theatrical production, which is built around a mythological troupe of mystical storytellers. This fantastical show that centers on the ancient art form of compelling narrative weaving has evolved over the years to become a uniquely diverse world unto its own. With this year’s addition of two special characters played by Bill Warriner and Jeremy Wood, stories are now shared with a deep purpose meant on discovering the truth behind this group’s twisted legacy. “The biggest difference and the thing that I’m most excited about with this ‘Phantasmagoria’ is the strong story arc and strong through lines tying all the stories together,” said Seth Kubersky, one of the co-directors of this production. Kubersky points out that this show aims to provide adults with a sophisticated horror show highlighted by fine acting of literary works, and not mindless blood and guts seen at other Halloween attractions. Stories that are shared by featured storytellers and other cast members are brilliantly acted and continue the tradition of content depth seen in years past. Joshua Geoghagan who plays Leon Krantz has a superb performance in his featured tale depicting a man’s wild descent into madness and murderess thoughts. 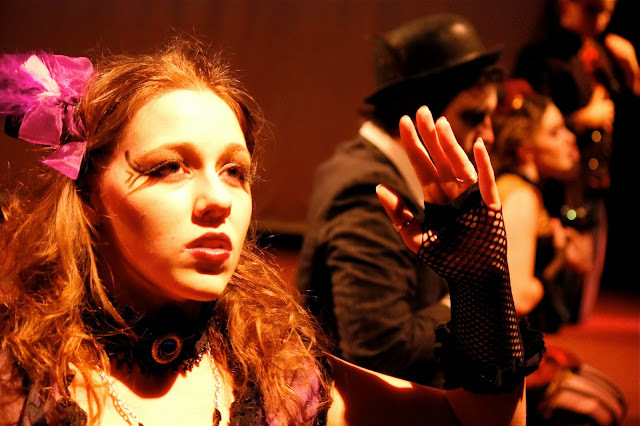 Another returning storyteller, Samantha O’Hare, who plays the role of Alice Liddell, is commanding in her on-stage persona and refined acting ability. There are also three newly featured storytellers that shine in their lead roles, including two lovely ladies Jill Lockhart who plays Rowan, and Angela Trapp performing as Isabella, and an all-new ringmaster who acts as the troupe’s master of ceremonies played by Stephen Lima. “Phantasmagoria IV” has an average run time of 75 minutes with no intermission, this includes a prologue and troupe introduction, six dance numbers including a set of aerial acrobatics, and eight stories that eventually lead to a grand battle and tearful goodbye. All this combined makes the pace of the show brisk, and cast members have stated that this is the most content fit into one show when compared to past performances. With all the talk of stories and their importance in this production, it isn’t until the first dance number that the magic of “Phantasmagoria” truly comes to life. Following the first story that's featured around the skilled dancer Pandora played by Gina Makarova, there is a hauntingly beautiful dance number which is inspired by ancient Greek culture and masterfully blended with enchanting original music. More intriguing stories and dance numbers are shared as the production continues to its final conclusion. With brilliant dance choreography and special guest actors that act as a connection for the audience, this year’s show becomes a rich world that grows ever complex as the theatergoers peer deeper into the looking glass. 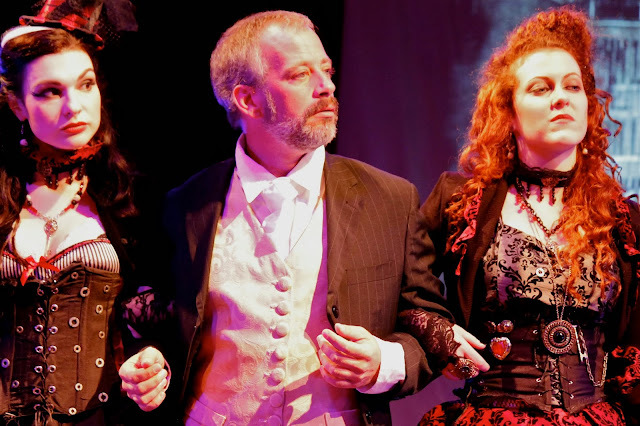 One of the seasoned cast members, Matt Carroll, who has been around for all four years of “Phantasmagoria,” spoke about many of the details with the progression of this production since its original conception. 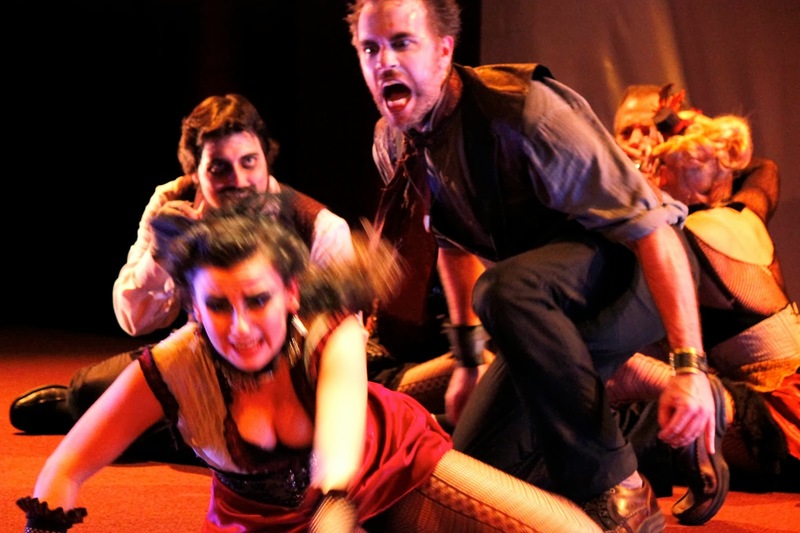 All performances for “Phantasmagoria IV: Hell Hath Risen” will be held at the Orlando Shakespeare Center on Friday, Saturday, and Sunday evening starting at 8:30 p.m., which began on Oct. 11 and will run through Oct. 31, along with two special Monday night shows on Oct. 21 and 28. Kaitlin Elizabeth Baxter who plays Mercury, sits next to her cast mates during the performance. Angela Trapp (left) and Jill Lockhart (right) are escorted by Bill Warriner near the end of the show. Mila Makarova looks on at Danielle Marcucci who is in great distress. Joshua Geoghagan goes after Danielle Marcucci in a mad fit of rage during his featured story.